and, here is the forecast for the next three days. and, while we are at it, two tornado watches are in effect until 10pm. America is always going over the top. We have gone over the top on security. Stop already. 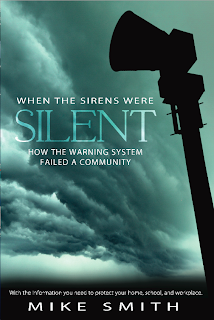 Another 5-Star Review of "Sirens"
"An admirable job of capturing what happened in Joplin." 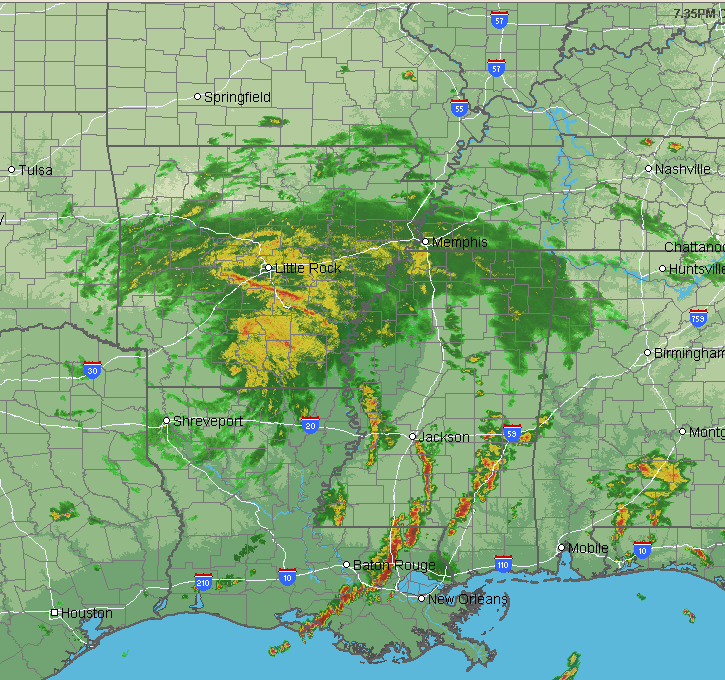 Drenching rains are moving north with the remains of Isaac. The center is along I-40 east of Ft. Smith. 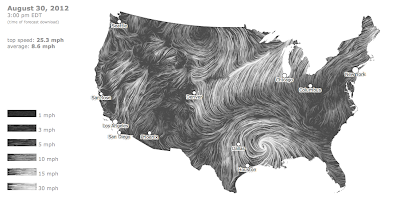 The circular wind pattern shows up nicely. 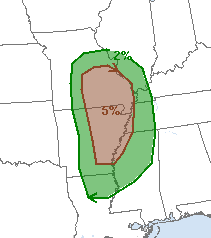 There is a tornado risk later today. Five percent is the "significant"threshold. 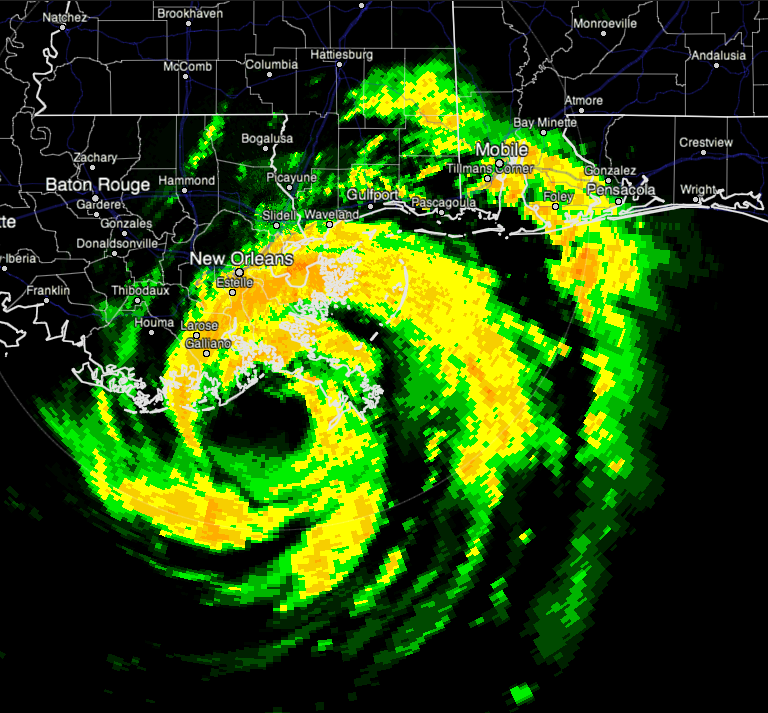 Heavy tropical rains are spreading north with the remains of Isaac. 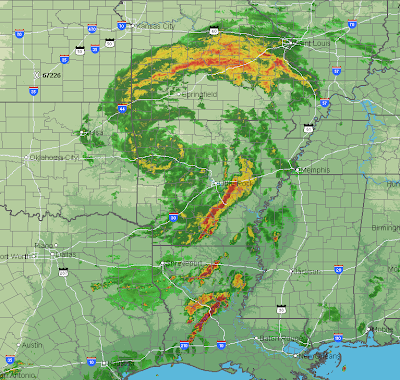 This was the regional radar at 7:35pm CDT. As Isaac moves north and interacts with a cold front, the rains will be quite heavy in parts of the Midwest. It does rain in Southern California. Lightning and thunder in progress. Green polygon is a flash flood warning. 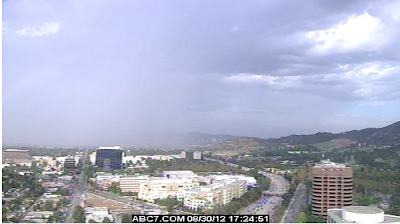 Addition, here is one of the thunderstorms over Burbank as captured three minutes ago on ABC7's Burbank Cam. Arkansas and southern Missouri tonight and tomorrow morning gradually moving into the mid-Ohio Valley late Saturday afternoon through Sunday. Current Winds Across the U.S.
Should be pretty easy to locate the front and the remains of Isaac. 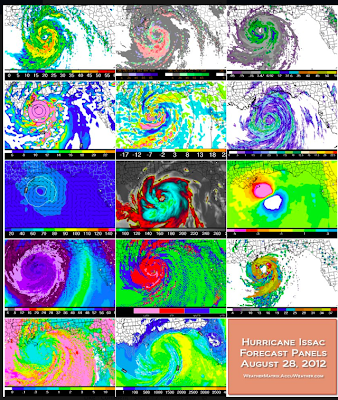 Meteorologists call this type of display a "streamline analysis." You can get them in real time here. 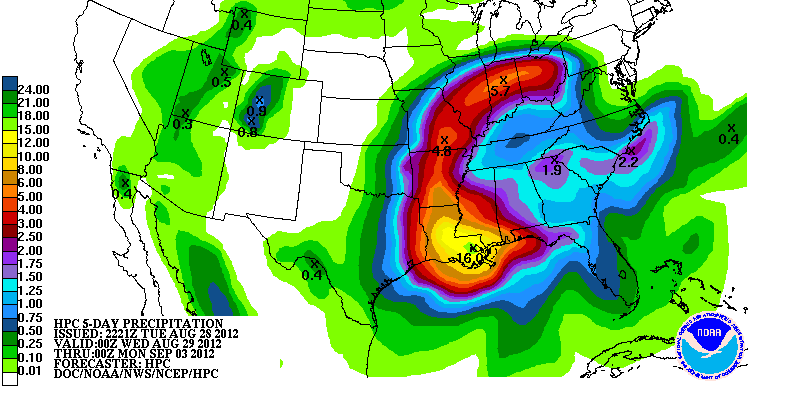 The what is left of Isaac continues to cause heavy rain. 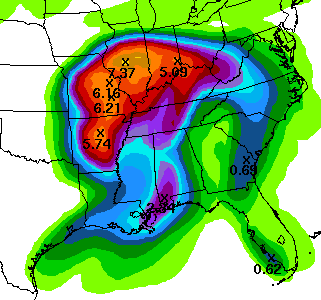 Here is the forecast for additional rain for the next five days. Gusty winds will continue north with the remains of Isaac perhaps reaching as far as the Lake of the Ozarks, Table Rock Lake, and Bull Shoals. Travelers and boaters should be aware of this possibility. This is storm chaser Jeff Piotrowski on I-10 between the city of New Orleans and the Louis Armstrong International Airport in Kenner. Addition 5:23pm. Superb photographic coverage of the disaster here. Addition 5:30pm. 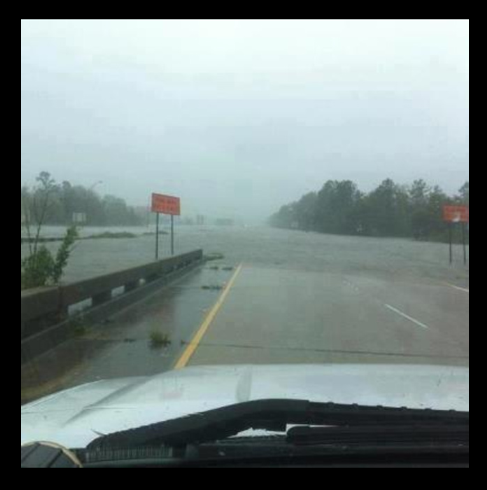 Interstate 10 closed due to flooding at Laplace, LA. 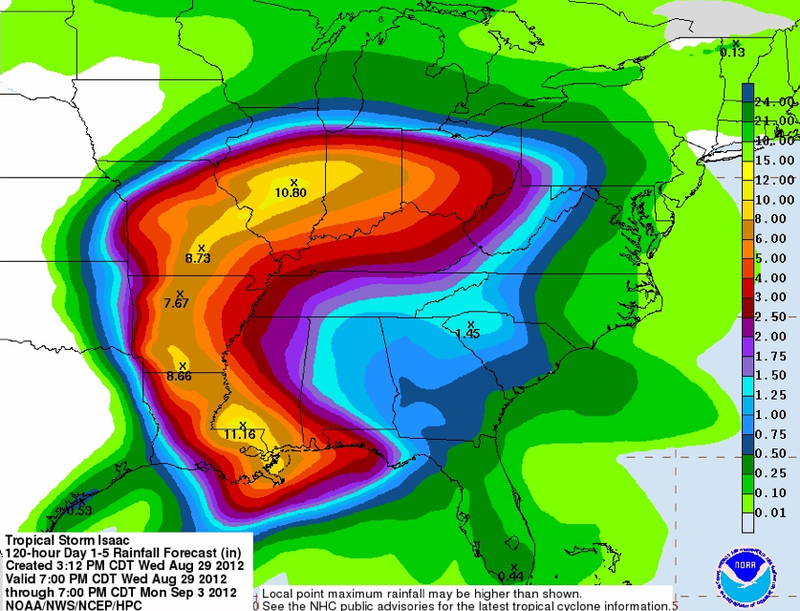 Isaac will end up being a very serious storm -- as forecast. 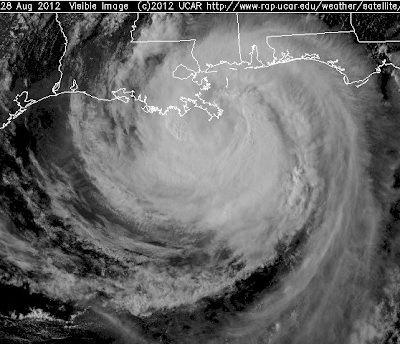 The above is a "true color" satellite image of Isaac this afternoon from NOAA. Winds are still around 70 mph and, according to the Hurricane Center, the storm surge is still seven feet in areas. The blue is a tropical storm warning. 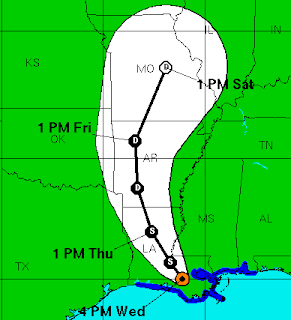 Isaac will turn more to the north tonight and tomorrow and increase in forward speed tomorrow. 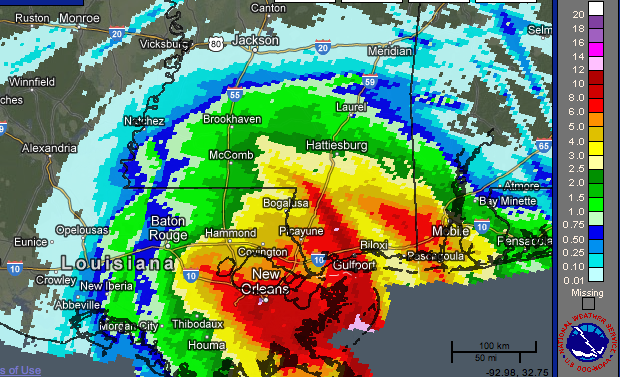 As of 4pm, the Audubon Park in New Orleans had recorded 17 inches. 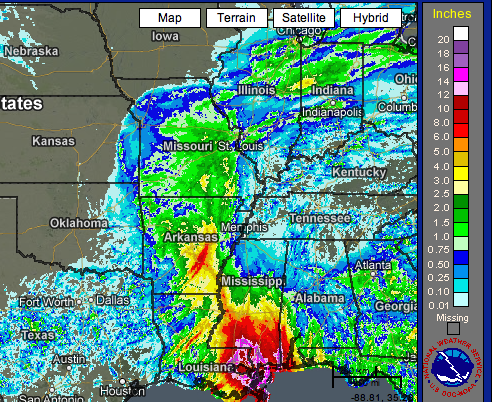 The map immediately below represents rainfall as estimated using both radar and rain gauges. Note: There may be some inaccuracy in the gauge-readings in the very high winds. 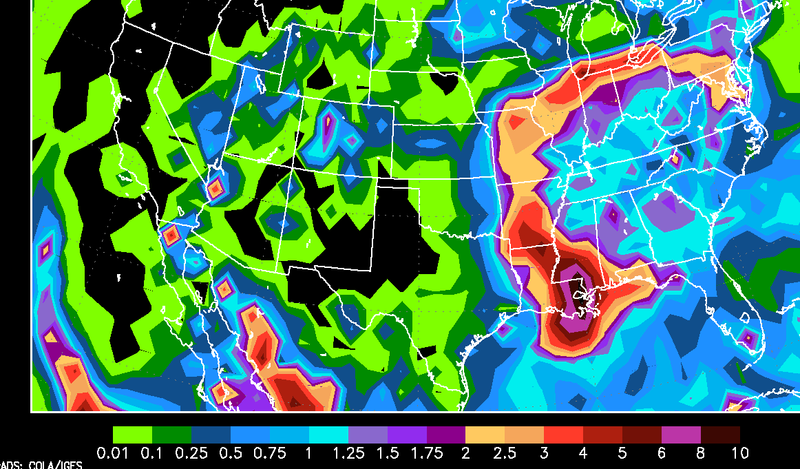 The light pink colors in two areas represent estimated rainfalls of 12 to 14 inches! 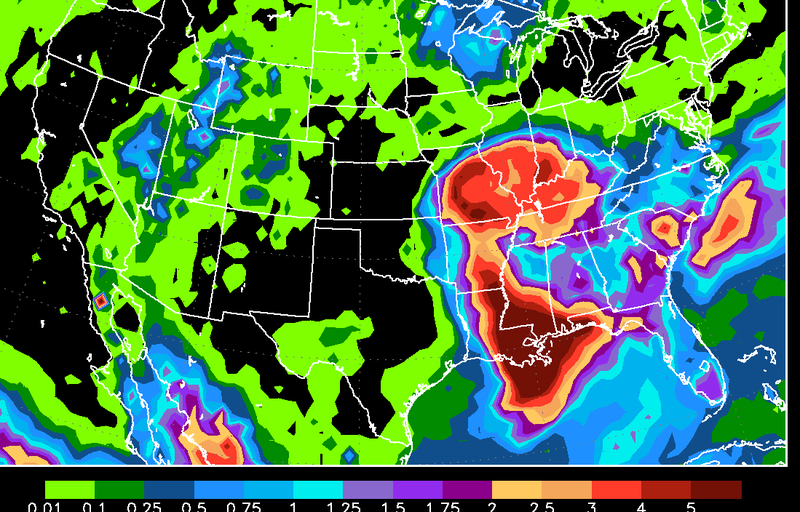 Here is a forecast of additional rainfall. Currently, NWS river forecasts show rivers rising (in some cases already above flood stage) from roughly Natchez on the west and Mobile on the east. 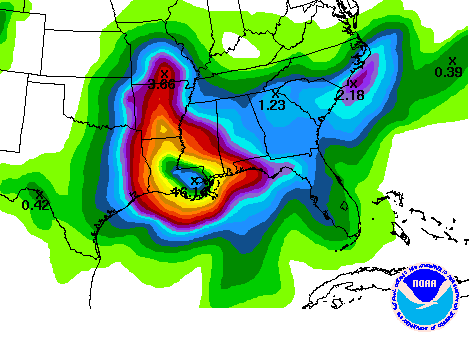 As these rains spread north through Louisiana, Mississippi and Arkansas, you should monitor the latest river forecasts if you live in an area that can be flooded. 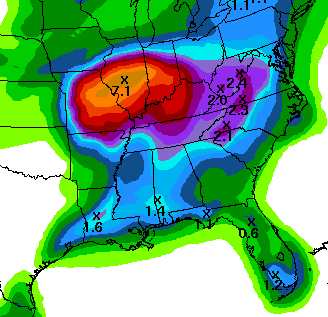 Please note the forecasts of more than eight inches of rain east of Springfield, MO and more than ten inches of rain east of Springfield, IL. Depending upon the speed at which they fall, these may be sufficient to cause flooding, drought or no drought. That said, in other areas, this rain will be most welcome. Finally, a tornado watch is in effect until midnight for the indicated areas. 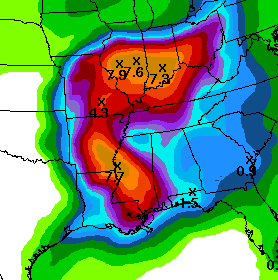 With concern about flooding and the Labor Day weekend coming up, I thought I'd post the two most reliable rainfall forecasts valid from now until Tuesday. The forecasts are for total rainfall during the period. 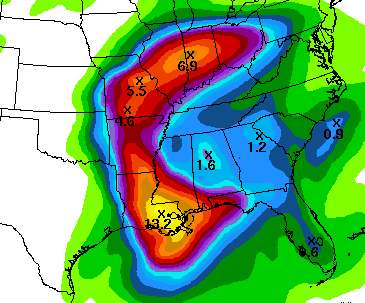 To give an idea of timing, the heavy rains will occur in Missouri Friday and Friday night. Areas north and east will be later in the weekend. Someone should write a book about "meteorologists as heroes." Oh, wait, someone did. It Isn't 'Just' a Category One Storm! Several times, this blog cautioned that Isaac was going to be a big deal where it came aground and that I was seeing too much false bravado by people in its path (via tweets and web postings). Some were out-and-out accusing meteorologists of "hyping" the storm. If you are in one of the (now) more than 500,000 690,000 homes/businesses (updated 7pm) without power and looking at a week or more without electricity -- or you are in one of the neighborhoods completely flooded by the storm surge or to be flooded by the major river flooding still to come -- you may be thinking that meteorologists' cautions were well founded. 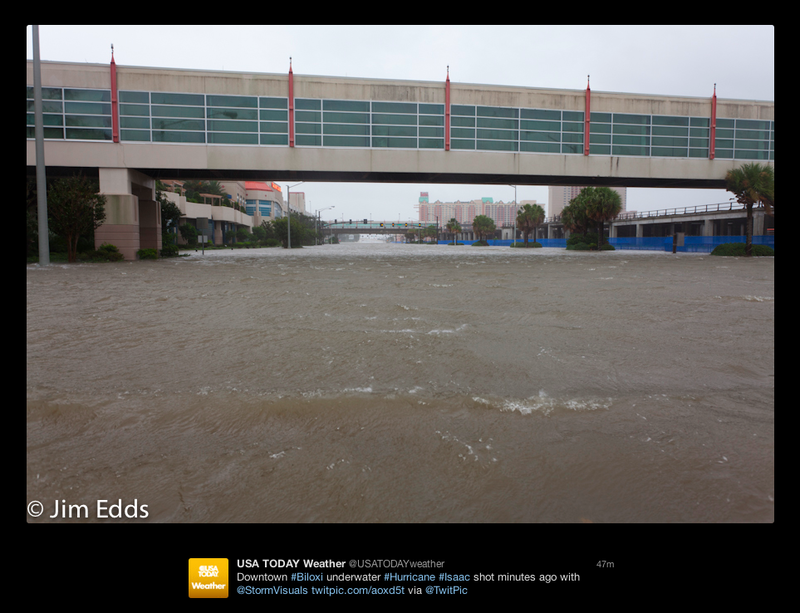 Photo of flooded downtown Biloxi via "USA Today" Twitter. Friend and meteorologist Nate Johnson has a good essay on underestimating hurricanes here. In a few weeks, when all the damage is totaled, I believe we will find that Isaac's toll will be surprisingly high for "only" a Category 1. 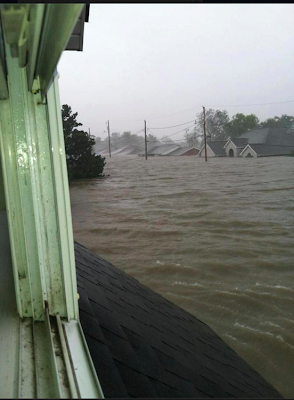 Addition: Southeast of New Orleans entire neighborhoods are under water. Photo from second floor window toward completely submerged homes. Literally hundreds of rescues today; many by taking axes to the roofs of homes because people moved into attics because of the rising water. First responders are risking their lives because people did not evacuate. This is from my creative friend and AccuWeather colleague, Jesse Ferrell. His entire posting is here. Each of these conveys useful information to meteorologists. Jesse assembled them ala some of Warhol's art. The storm has not weakened. It is creeping northwest. 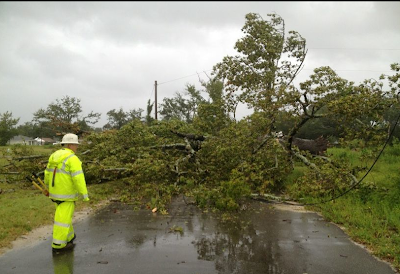 The eye is near Houma and my friend Patrick Marsh reports at least 80 mph winds there. 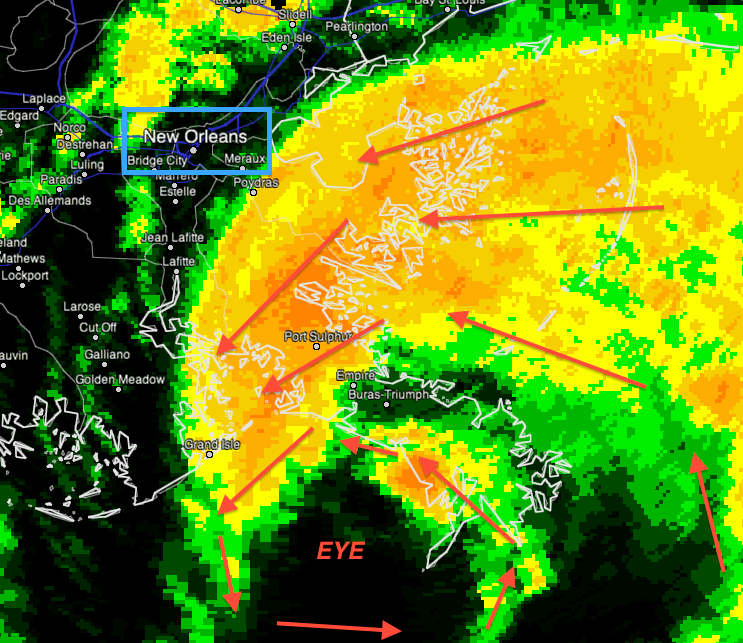 New Orleans' Lakefront Airport has had gusts to 63 knots which is 72 mph. Storm surges continue high. Per nola.com, there are 451,000 homes and businesses without power. With strong winds continuing, even more may lose power before the storm exits. Because the storm is over marshy land and because it is still well-organized for a level 1, peak winds will stay around 75 mph at least into this afternoon. 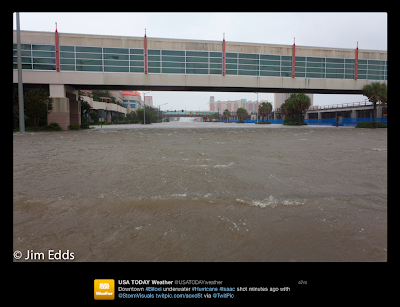 There is a lot of flooding due to both storm surge and due to torrential rains. Additional rains are posted below. "Why Is He So Excited?" Does He Want Bad Things to Happen? Note: Similar questions came up today, so I am reposting this from Saturday. Why is he so excited? It is like he wants it to be a hurricane and destroy everything. NOT ONCE does he say " I hope it does not get stronger, hopefully things could happen so it may weaken." Why so negative? Oh that's right he wants bad things to happen so we want to watch him. I empathize with the young lady who posted this. Let me see if I can explain what meteorologists are thinking. 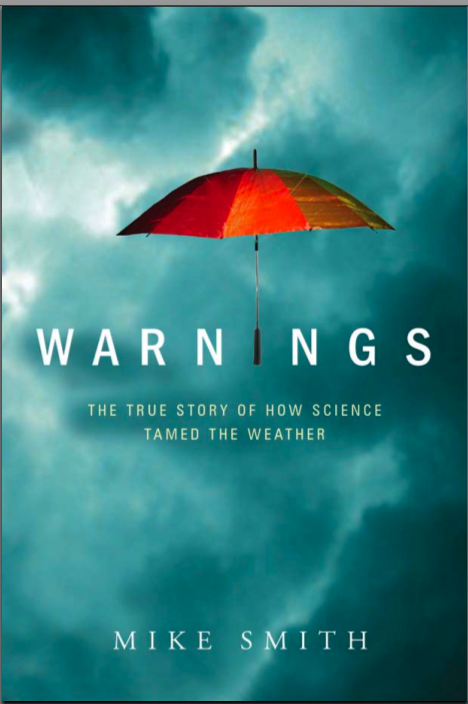 Chapter Three of Warnings: The True Story of How Science Tamed the Weather is titled, "Nice People, But Odd." In it, I talk about some of the idiosyncrasies of meteorologists. I was once at a firehouse when an alarm went off. The excitement/anticipation as they were donning their gear was palpable. Adrenaline was flowing as they zoomed off in their trucks. The firemen wanted to make sure they were able to do the job for which they were trained. Even though they were excited, I had no sense they were "looking forward" to the fire. The same is true of the AccuWeather meteorologist yesterday. There is the possibility that Isaac could turn into a major hurricane -- something that has not occurred in the U.S. in nearly seven years. There is concern that people, especially new residents in coastal areas, might not know how to prepare. So, there was urgency in his delivery to help convey the threat. Actually, we at the end of the Keys would hope that all the weather channels hype will be the strongest part of the storm; all we may get is some rain and wind. Right now, the main issue is having enough ice and libations on hand in case a party were to break out. Should be an interesting couple of days coming up! "What a lousy day." = I forecast storms and none occurred. 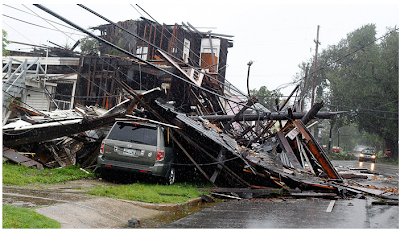 Before you get indignant and say, "How dare they 'wish' for storms!" give me a moment to explain. The photo below is a 100% tornado. It was over western Kansas rangeland and did zero damage of any kind. Jaime and I could not have been more thrilled. 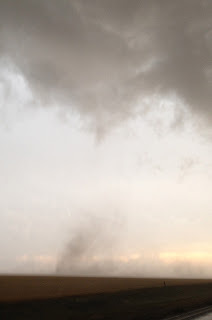 We tracked down the tornadoes (we targeted the only tornado-producing thunderstorm of the day more than two hours before the first touchdown) and outsmarted mother nature. 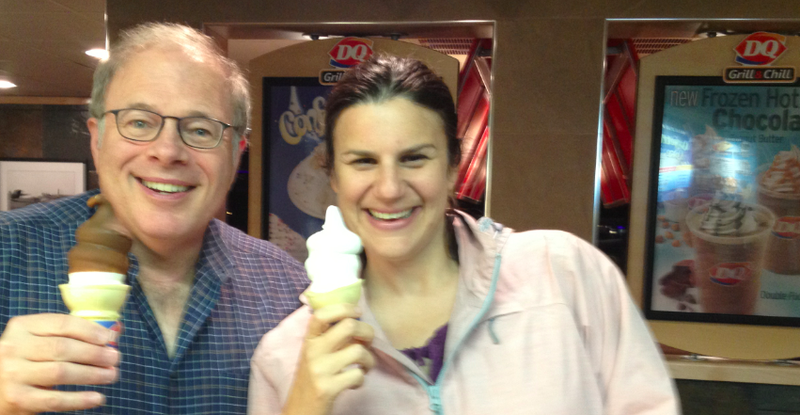 We did the traditional DQ celebration. There would have been no celebration if there had been damage. We would have shifted into rescue mode calling in the authorities and helping where we could. I keep work gloves in my trunk for that reason and always wear heavy shoes when chasing -- just in case. Finally, there is a second reason for calling it a "lousy" day if your (for example) blizzard forecast doesn't materialize and that is the ridicule you will receive. Another unique aspect of meteorology is that no one cheers for us. Think about it: When Captain Sullenberger landed his plane in the Hudson River he was treated as a hero. When a flanker catches the winning pass in the end zone the crowd goes wild. 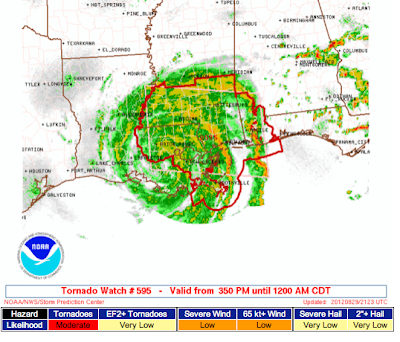 Who cheers for meteorologists when they get a hurricane forecast right and save lives? No one. If anything, we get blamed (see Nagin, Ray) even though we do an outstanding job. 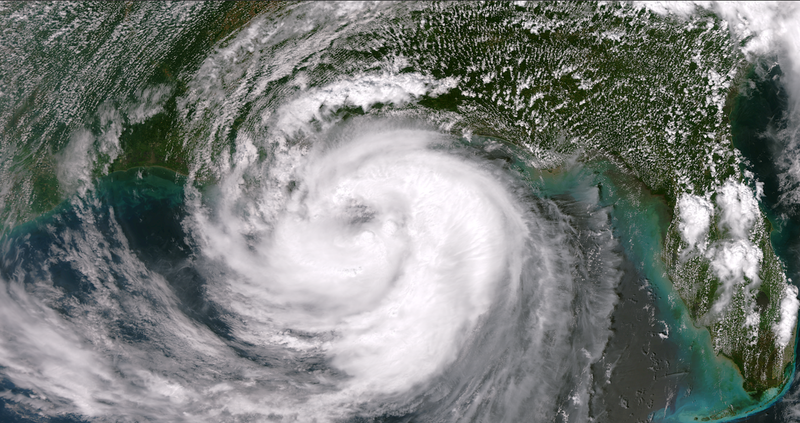 To take Katrina as an example, yes 2,000 died -- largely due to people not evacuating even though warnings were accurate and out in plenty of time. But, without the warnings, the deaths would have been into the tens of thousands! That is not my opinion, the government studied it. An unwarned major hurricane in New Orleans would kill between 40,000 and 60,000! So, meteorologists save tens of thousands of lives and we get the sound of crickets. A "good" forecast is one that is correct regardless of what is being forecast. We just hope the storms we forecast hit unpopulated areas and little or no damage occurs. This is the radar from 10:25pm. 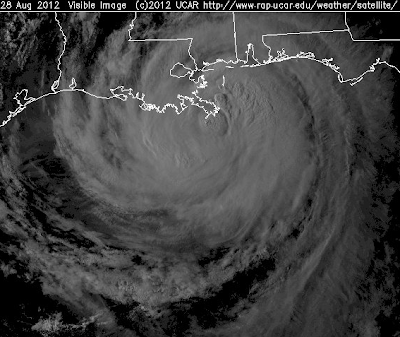 The center has drifted just about straight west the last few hours and the structure of the storm is better organized. The winds are still less than would be expected with a central barometric pressure of 968mb. The storm continues to batter the region from about the Florida-Alabama border west across southeast Louisiana. 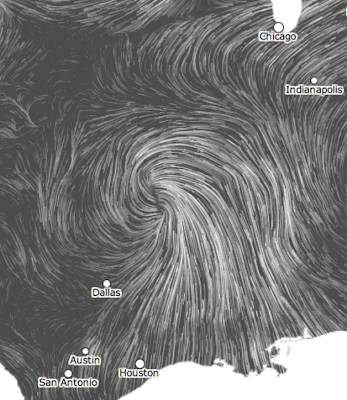 It is the fourth straight hours of NNE winds gusting to 55-65 mph across New Orleans. That will change little during the night and, if anything, winds may increase as the center drifts WNW. 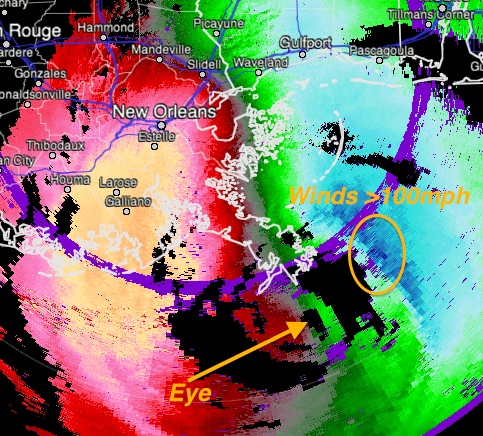 Wind speeds seem to be increasing near the eye. The brown color SSW of New Orleans is winds aloft of more than 110 mph. These are getting closer to the ground. 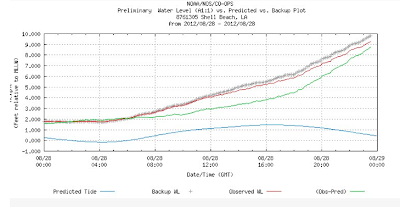 N.O's levees are going to take quite a beating overnight -- of longer duration than Katrina's. Here's hoping the new levees can withstand it. Regardless of wind and storm surge rainfall across the area will be in the 15 to 18 inch range. 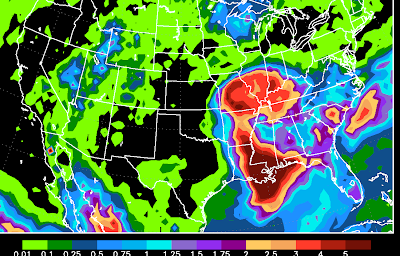 Widespread, major flooding is likely. The tornado watch continues overnight as indicated below. Daniel called the whole situation "very surreal" in a phone interview after Tuesday's practice in Cincinnati. "I think there's just a big feeling of unknown for me," Daniel said. "I don't know what's going to be at my house when I get back. I don't know if my windows are going to be busted out. I don't know if my TV or my belongings are going to be there. The only thing that really matters is that my family is in Dallas. All that other stuff can be replaced. But you think of other guys with families that have done a great job of getting families out of town. That's first and foremost. "But this feeling of uncertainty and unknown is really something I'm not used to." FYI: As of 8:40pm 150,000 homes and businesses are without power. Correction: I originally had Mr. Daniel's surname misspelled in the headline. Apologize. I have outlined the area of strong winds which is moving toward the WNW across the New Orleans area. 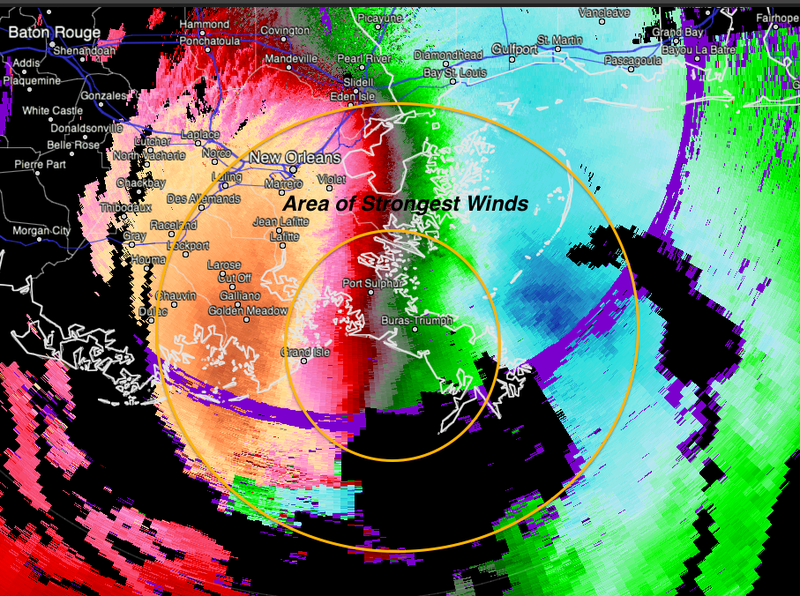 Winds are gusting to 65 mph at Houma (SW of New Orleans) with 85 mph over Houma at 2,100 ft. 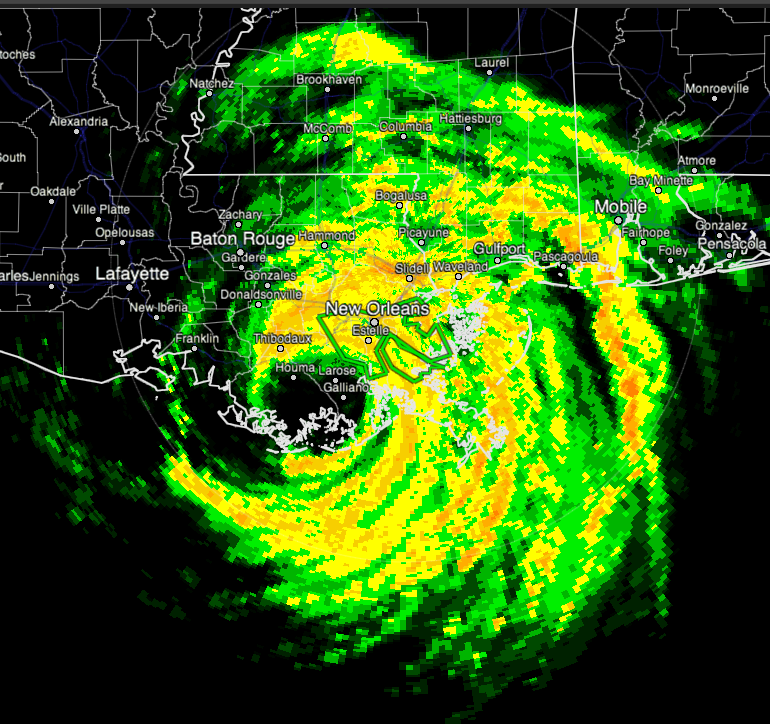 In the City of New Orleans (11 o'clock in the donut), winds are now gusting to 67 mph. Torrential rains are falling. More than 110,000 homes and businesses are without power in the region. The area of dark blue at the 3 o'clock position in the donut is winds of more than 100 mph about 3,000 ft. above the ground. Some the these stronger winds may make their way down toward the ground overnight. 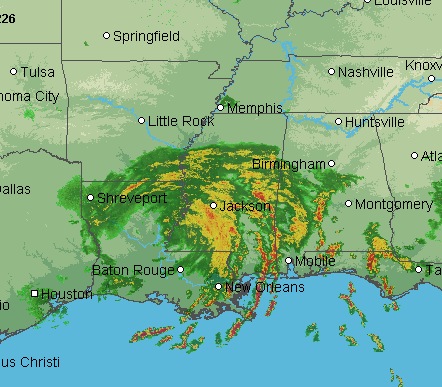 At 7:10pm, 100,000+ homes and businesses without power in southeast Louisiana, including New Orleans. 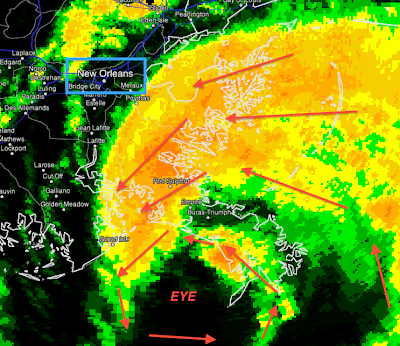 Grand Isle just had a gust of 76 mph. Barometric pressure has dropped another 3 mb to 967 mb. The storm is still slowly strengthening. 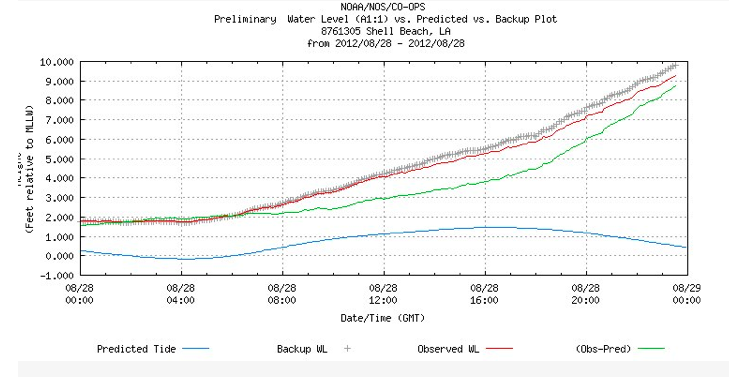 The graph is the tide The storm surge is running above forecast at the present time. 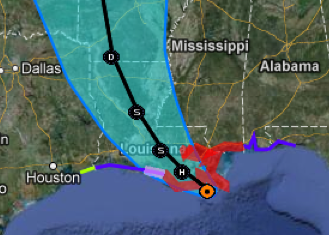 The green line is the forecast and the gray is actual. The surge is about 1ft. above the forecast. Hat tip: Jesse Ferrell. Below is a map of Shell Beach (orange peg), which is southeast of New Orleans. 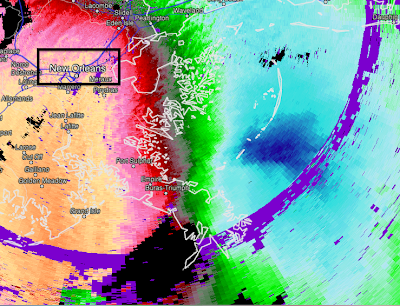 Winds are now gusting to 64 mph at New Orlean's Lakefront Airport and are steadily increasing. The large yellow-orange area on radar moving into the metro area from east to west with both torrential rains and wind gusts that will gust well above 80 mph, especially on the east side of the area. 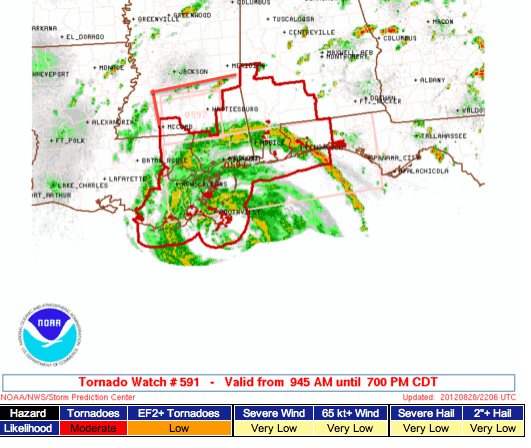 Here is the new tornado watch in effect until 7am. Satellite image from 6:02pm. 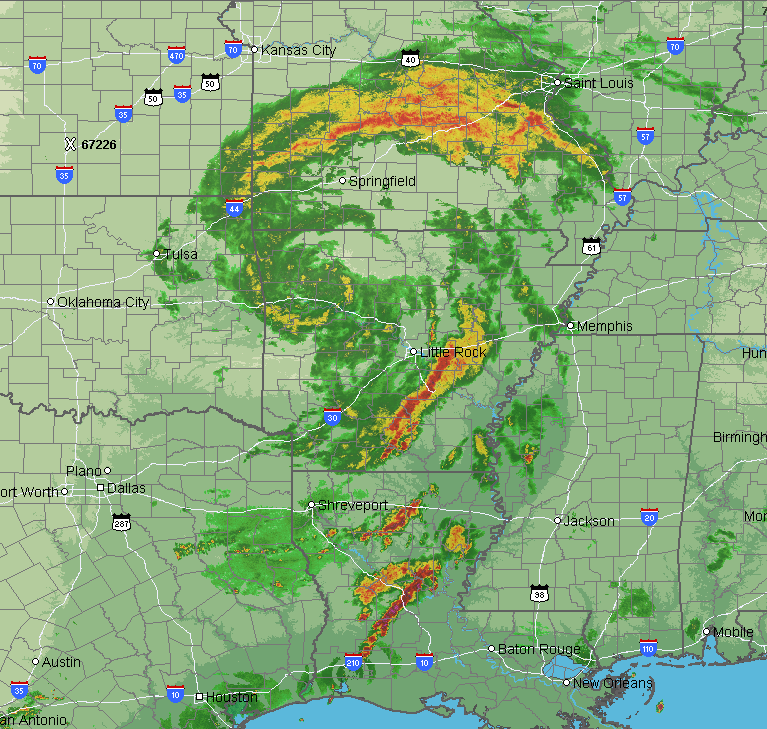 The little overshooting top just south of the mouth of the Mississippi is the center of the storm as it moves northwest. The Doppler radar shows the 105-110 mph winds (deep blue color) have moved closer to the radar and are now about 5,000 to 6,000 ft. above sea level. Winds of 110mph have just been confirmed by a Hurricane Hunter aircraft. 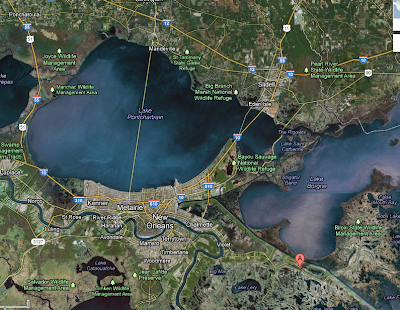 New Orleans in black rectangle. Dark blue = very high winds just offshore. Under the deep blue color, the wind has gusted to 97 mph as measured by a oil platform above the water's surface. Clearly, Isaac continues to intensify. The storm is moving northwest 8-10mph. 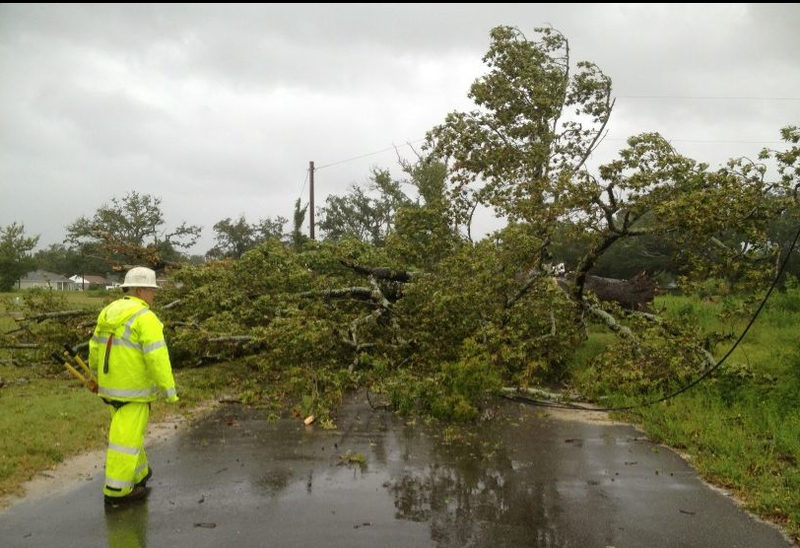 Jim Reed just sent this photo of a toppled tree in Gulfport, MS. 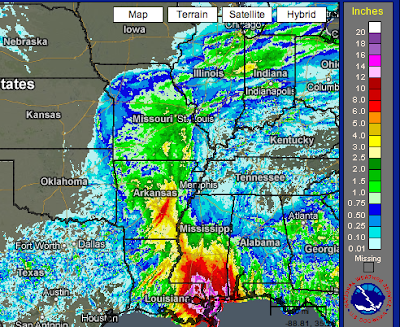 Here is the 5-day total rainfall through 7pm Sunday. 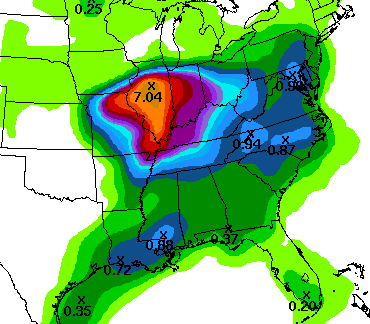 Beneficial rains in the Corn Belt and Delta soybean area. 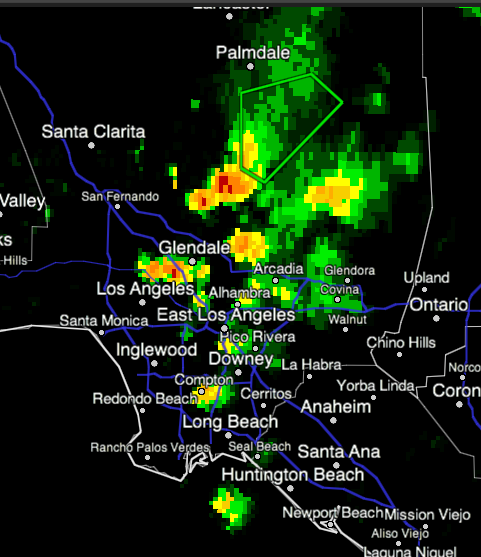 The storm clearly is becoming better organized as indicated both on satellite and radar. The satellite from 4:32pm CDT looks like a classic hurricane except for a cloud-free eye. The radar in the last 30 minutes seems to show an eye forming. The image below is from 4:53pm CDT. The National Hurricane Center rates Isaac's sustained winds at 80 mph at 4pm. I'm getting concerned that significant strengthening may be occurring because the radar is measuring winds as high as 107 mph about 8,000 ft. above the ground at 5pm. 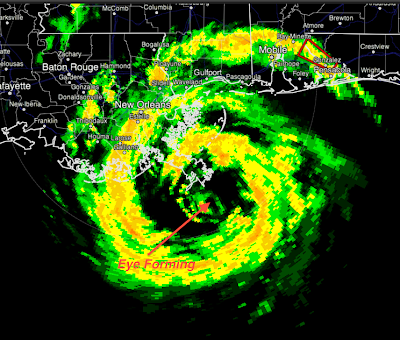 At 4:35pm, a wind measuring device 280' above sea level on an oil platform off the coast measured a gust of 105 mph. I'm concerned these stronger winds will make their way down toward ground and sea level as the evening and night progress. 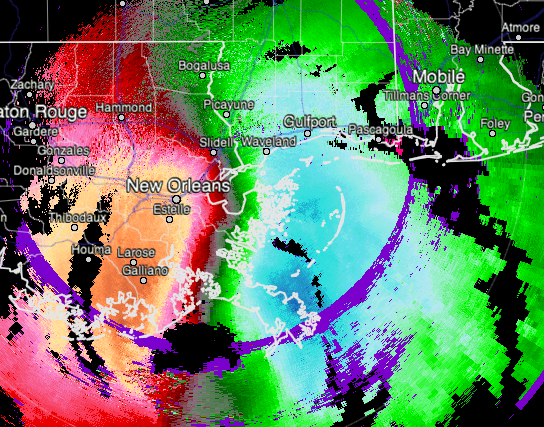 Currently, at New Orleans' Lakefront Airport, winds are gusting to 58 mph. The winds will gradually increase during the evening. Late addition: 30,000 homes and businesses without power in New Orleans. 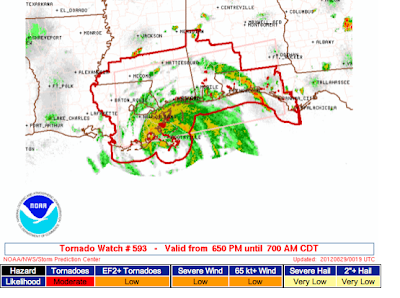 A tornado watch is in effect for the entire area outlined in red until 7pm CDT. 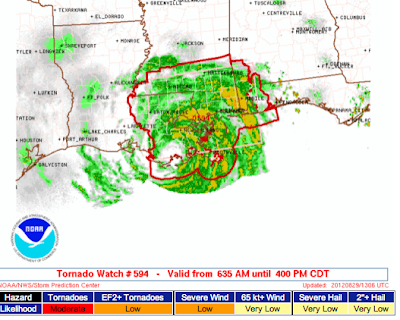 The watch will likely be extended. Additional rainfall from 7pm this evening through 7pm Friday includes a forecast of more than 17" in New Orleans. 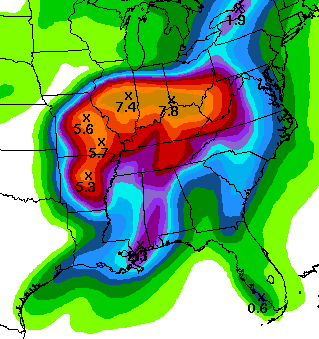 Widespread flooding from both rainfall and storm surge are likely. "A Great Job of Storytelling"
Heads Up South Florida and Northern Gulf Coast!! Who Ya Gonna Call? Drought Busters! Extended Excerpt of "When the Sirens Were Silent"